When I was in my twenties and very early thirties, I drank a lot. Not at breakfast or anything (ummm. . .except when I was tailgating at Chiefs games. But that doesn't count, right? ), but many nights. And of course, when you drink 4 beers (I'm 5'2 and back then I was fairly small) and then get up to go to work early the next morning, you get hangovers. Now I'm 42, not small and don't drink very often. . . .but I still feel hungover a lot of the time. Thanks to Jeff H. for sharing this photo of drunk me on Facebook. Headaches. I don't know whether it's my allergies, age or what, but I often wake up with headaches. Just like I did when I had hangovers. Unexplained bruises. I think I must have tripped a lot in my partying days, because I often had bruises I couldn't remember getting. I don't often have bruises any more, but when I do I have no idea how I got them. Hazy memory. Back then, I would forget why I thought it would be a good idea to dance on a table to Baby Got Back. Now, I just forget why I walked into a room. Or where I left my purse. But the principle is the same. Muscle soreness. In the olden days, I might wake up with extremely sore legs and (eventually) realize that I'd spent the better part of the evening doing the Mary Katherine Gallagher Superstar move. Now I know it's just my workout, but the pain is still there. Need for water. I used to only drink water to combat and/or recover from hangovers. I drank a lot of water and really regretted when I didn't. Now I drink a lot of water because I feel yucky if I don't. Loathing of loud noises. Sudden, loud, jarring noises used to only bother me when I was hungover. Now they bother me all of the time. It makes parenting really interesting. Puffy eyes. The eye bags that just used to appear when I was very ill or hungover? Now they're here all the time. Crappy skin. The blotchy, wrinkly skin that also used to appear when I was very ill or hungover? Also permanent now. Lol, I'm 33 and I suffer most of these same things. Matter of fact it's a funning joke with my Mr. about how easily I bruise, and never know where my bruises come from. So funny! Oh, and yea, I have sympathy acne because of all the teen boys in my house! That really blows. 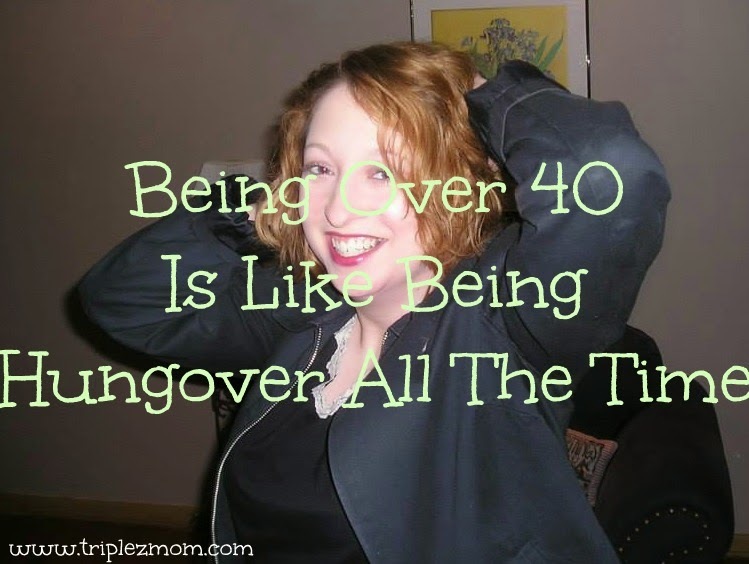 I'm dreading the big 4-0. I'll go kicking and screaming with my nails dug into the earth. It's pretty scary for me. Isn't it wonderful what aging does to us? Drinking all that water is good for you though...you'll need it for your 50ies! I joke with my hubby every year that I am falling apart more! It won't be long before I am 40. LOL.. great post. I suffer from a lot of those too and I am in my mid 30s. I am 37 and feel you on a lot of this already. My skin is dry and I noticed that my arms look wrinkly. What the heck? Who gets wrinkly arms? Dry and wrinkly = not attractive, lol. LOL. That's funny. I often feel that way too. At 47, I definitely understand where you're coming from! Haha. I'm a little Southern Baptist girl who is 44 and never drank a drop . . . except for that one time when I had about an ounce or two of homemade strawberry wine (from a neighbor) to help cure a bad case of pneumonia . . . anyway, I'm 44 now and have all these symptoms. I'll be in real bad shape by the time I'm 62! LOL! i'm not quite 40 and feel that way all the time, not fair! At least with drinking you get some fun stories to tell, with old age, you just forget all the stories :( totally not fair! Stopping by from type a parent. Glad I found your blog! I'm a new blogger writing about lifestyle over 40 and I'm so glad to find other ladies in the same boat. Have a great weekend!